Changes in the Sun over the 11-year solar cycle modify the amount of ozone in the atmosphere over the tropics above 20 km. It is thought that the temperature change resulting from the induced variations of ozone may lead to an impact on the surface climate. Knowing by how much the solar ultraviolet light changes over the cycle is key to understanding the size of that influence. We provide a new model dataset of solar irradiance variability and compare it to the standard model used in climate studies, and to solar observations. We have shown that our model agrees better with an older instrument observing solar irradiance than the standard solar model for climate, though the two solar models and the older observations display much lower solar cycle variability than more recent observations. We discuss the differences and the uncertainties in the measurements. We also demonstrate that the true effect of solar ultraviolet changes on ozone is highly uncertain. This is important to be aware of since our understanding of the Sun’s impact on climate depends, in part, on getting the solar cycle changes in the ultraviolet correct. The energy, or irradiance, from the Sun varies, most famously, from maximum to minimum activity and back again, in a cyclical fashion over the ’11-year solar cycle’. This irradiance variation is driven by changes in magnetic fields at the Sun’s surface that form large sunspots, which decrease the energy released from the Sun, and small bright regions, faculae, that enhance the energy coming from the Sun, particularly in ultraviolet light (see Figure 1). The lower part of Figure 1 shows the sunspot number (SSN) varying from solar minimum in 1996, to a maximum around 2001-2002, before returning to solar minimum in 2008; similarly, in the upper plot ultraviolet light increases and decreases with the sunspot number, and so ultraviolet energy from the Sun is highest when the sunspot number is at its maximum. The Sun is also thought to vary on century-long time scales. As the primary energy source driving the climate system, any changes in the energy output of the Sun should lead to a modification of the climate system. While the Sun has had little impact on the current global changes in climate [T. F. Stocker et al., 2013], changes in its energy output are thought to have a regional impact on surface temperature and precipitation, particularly in the northern hemisphere over North America and Europe [S. Ineson et al., 2011]. The signal, in e.g. the Earth’s surface temperature, from a varying Sun is small compared to other factors influencing the climate, and difficult to identify. It is possible to extract it from observations statistically (e.g. [J. Austin et al., 2008]), but another approach to understand the solar influence is to use atmospheric and climate models to see how the Earth system responds to an applied change in the energy coming from a simulated Sun. First, we discuss the mechanism by which the Sun is thought to impact on surface climate. This influence is thought to be initiated high in the atmosphere over the equator, where the Sun’s high-energy ultraviolet light (at wavelengths shorter than 320 nm) is absorbed, forming an ‘ozone layer’, mainly between 20 and 60 km, with a maximum around 25 km. This region of ozone forms because oxygen molecules, `O2′, are highly abundant in the atmosphere and because high levels of short wavelength ultraviolet light are most readily available at these altitudes (they are usually absorbed before reaching the surface). Ultraviolet at wavelengths shorter than 242 nm break apart the O2 to form two O atoms that immediately combine with other O2 molecules, due to their high-abundance, forming ozone, or `O3′. There is a competing effect from wavelengths shorter than 320 nm, which destroy ozone. Nevertheless, when the Sun is more active, and therefore giving out more ultraviolet light, the ozone production process wins-out over the destructive one, leading to more ozone being produced at solar maximum. The solar cycle response is strongest over the equatorial tropics due to the highest amount of energy per square meter being received there. Both productive and destructive ozone processes lead to absorption of energy from the ultraviolet light that excite the O, O2 and O3. Eventually, the excited particles bump into nearby ones and the energy gets distributed in the local atmosphere, which heats up. At this altitude in the atmosphere, there is a general, time-averaged, circulation pattern of rising air at the equator, pole-ward flow at mid-latitudes and descent near the poles. We can detect this flow if we average over lots of observations. This circulation is driven by waves, propagating up from near the surface that break, like waves on the beach, dump their energy and drive the circulation. The circulation pattern is also influenced by the temperature difference between the equator and the pole, because more energy from the Sun arrives at the equator. Nature likes to even out differences in temperature, so a wind begins to flow, carrying warmer equatorial air to the colder poles. But, as it travels there, the rotating Earth deflects the wind and a jet of air forms and surrounds the winter-time pole. This jet acts as a barrier, preventing exchange between a cooling, nighttime pole, and the warmer air at lower latitudes. This enhances the strength of the jet. The increased energy from the Sun at solar maximum leads to an even larger difference in temperature between the equator and the pole. This modifies the poleward transport, leading to a slowing of winds near 50 km above the mid-latitudes. This slowing typically begins around October during periods of high-solar activity [S. Ineson et al., 2011]. The presence of this slower wind affects how the upward propagating waves travel through this high altitude region, and they deposit energy in a different place. As a result, the jet that forms close to the pole becomes perturbed and, over the following months, descends to the lower layers of our atmosphere, where our weather forms. It is thought to disrupt the winds travelling from North America, across the Atlantic, and into Europe. Solar minimum conditions tend to bring cooler winters in Northern Europe with less rain, while North America, Greenland and southern Europe are warmer. The impact is much less pronounced in the southern hemisphere. We see this Sun-induced effect, on the surface temperature over Europe, extracted statistically from observations [T. Woollings et al., 2010], and also from models [S. Ineson et al., 2011]. The signal found in models is proportional to the magnitude of the changes in the ultraviolet over the 11-year solar cycle. The very first step in the whole chain that leads to changes in our weather may be the change in ultraviolet light, though other studies suggest that particles emitted from the Sun may also contribute [M. E. Andersson et al., 2014]. The problem is that the stability of our direct measurements of the Sun’s ultraviolet light from satellites spanning several decades is low, and so the size of the solar cycle changes are highly uncertain. Figure 1: (top) The solar cycle changes in the ultraviolet band integrated between 242 and 260 nm. The absolute levels of all time series have been shifted to give the same absolute value as the SATIRE-S model around August 2004. Shown are the observations from the older SUSIM instrument (purple), and the newer SORCE observations from SIM (black) and SOLSTICE version 12 (green) and the solar models SATIRE-S (blue) and NRLSSI (red). Dashed lines (right) indicate the level of solar minimum around 2008 in each dataset, while dotted lines indicate the approximate solar minima and maxima values around 1996 and 2002, respectively. All datasets have been smoothed by averaging over 365-days. (bottom) The smoothed sunspot number (SSN) for the same time period as in the top plot. The important ultraviolet wavelengths for ozone production are below 242 nm, and for destruction below 320 nm. From the perspective of observations, there are essentially two satellites showing either ‘small’ or ‘large’ solar cycle change in the ultraviolet. The lower solar cycle changes, of between 1 and 10% (always with higher variability at shorter wavelengths), were observed by the SUSIM instrument (see Table 1 for information on acronyms) from 1991 to 2005 [L. E. Floyd et al., 2003]. The larger changes, by up to five times, were observed by both SIM and SOLSTICE instruments, collectively on the SORCE satellite, from 2003 to present [G. Rottman, 2005]. Forcing climate models with these larger ultraviolet changes (see Figure 1) leads to a climate response more similar to observations than when using the smaller changes [S. Ineson et al., 2011]. However, these observations only cover a relatively short period and at most just one solar cycle. To investigate the Sun’s impact on climate, longer records are needed covering several cycles or more, so that the signal can be seen in (or extracted from) the high variability of the climate system. Therefore, to extend to such long periods requires ‘solar models’ to calculate variations in energy coming from the Sun. From the model perspective, there are essentially two options for atmospheric and climate research: SATIRE-S [K. L. Yeo et al., 2014] and NRLSSI [J. Lean et al., 2005]. This publication [W. T. Ball et al., 2014] represents the first reconstruction of changes in the Sun from the SATIRE-S model that covers every date from 1974 to 2009 and all wavelengths from 115 to 160,000 nm and thus becomes extremely useful for investigations of solar impacts upon our climate (Subsequently, SATIRE-S has been updated by [K. L. Yeo et al., 2014]). SATIRE-S is constructed in a different way to NRLSSI. The latter is empirically derived from direct irradiance observations, while the former recreates irradiance using images of the Sun to identify dark sunspots and bright faculae and then calculate their brightness using model calculations. SATIRE-S displays solar cycle variations in the ultraviolet similar to the SUSIM instrument. Compared to the much larger ultraviolet changes from the SORCE satellite, both models are quite similar. But, in the ultraviolet between 250 and 300 nm, SATIRE-S displays changes between solar maximum and minimum twice as large as NRLSSI (see Figure 1). This has important consequences for ozone as these wavelengths dominate the destruction processes of ozone high over the equator. At this stage it is important to point out a few caveats: (i) the large ultraviolet changes observed by the newer SORCE observations have an uncertainty range that covers both models and the older SUSIM observations; (ii) it is thought that the newer, larger observed changes result from damage to the space-based instruments from the solar ultraviolet light, which leads to a change in how the ultraviolet is detected by the instruments – if not properly accounted for this leads to a much larger variation observed than there really was ([W. T. Ball et al., 2011]; [J. Lean and M. T. DeLand, 2012]; [I. Ermolli et al., 2013]); (iii) though both instruments on SORCE show large changes, SOLSTICE and SIM do not agree with each other either, with SIM showing even larger variations, so we focus here on the smaller, but still large, changes from SOLSTICE; (iv) it is not possible to completely discount SOLSTICE based on the information discussed here, so we should consider the variations as possible; and (v) it is possible that the surface responses in climate models do not agree so well with those extracted from observations because the models are not adequately simulating the waves that drive the high-atmosphere circulation, or feedback from ozone is not fully included. Changing how these waves are considered in the models may lead to a response similar to the observations, but using a lower forcing. Figure 2: The ozone change between 2003 and 2008 (~65% of the solar cycle) between 25 and 60 km averaged between 20 S and 20 N. Shown are changes in ozone from a 2D atmospheric model: SOLSTICE/SORCE version 10 (purple), SOLSTICE/SORCE version 12 (green), the SATIRE-S model (blue) and the NRLSSI model (red). Note that the negative response in SOLSTICE has shrunk from ~-1.6% to -0.3%, between versions 10 and 12, near to 60 km. The large, SOLSTICE-like ultraviolet changes are interesting not just because of their potential to affect northern hemisphere winter climates, but also because when applied to a simple model of the atmosphere they produce a response between 50 and 60 km that looks more like those of recent satellite observations of ozone: unexpectedly at these altitudes it appears that when the Sun is near solar maximum, less ozone forms, though more forms below; and, conversely, at solar minimum there is more. The NRLSSI solar model has not been able to produce this decrease in the atmospheric model at maximum, only an increase. We show that the SATIRE-S model can produce this negative response, because of the larger ultraviolet changes above 250 nm. 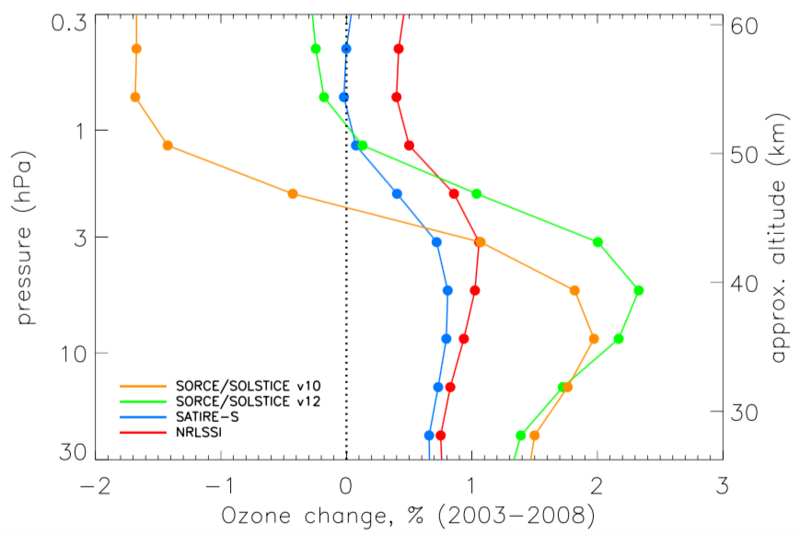 But, the change in ozone simulated using SATIRE-S is tiny compared to that of SOLSTICE (see Figure 2). Thus, this result from the ozone observations appears to support the larger SOLSTICE changes. However, as more SOLSTICE observations accumulate, better assessments of the data can be made, and improved corrections can be applied to update the data. The results described above for climate, and for the ozone response, have used earlier versions of the data. We have shown that a change from version 10 to 12 of the SOLSTICE data has led to a factor-of-six decrease in the strength of the negative ozone response to the solar cycle above 50 km (Figure 2). It is still negative, but much smaller. Though not calculated here, it is reasonable to assume that by considering the large uncertainties on SOLSTICE, one cannot make any conclusion about the validity of the SOLSTICE-like solar cycle changes by using ozone observations alone. In addition, it is clear that newer versions of the observed solar cycle changes from the newer SORCE satellite will mean that earlier studies cannot be compared with newer ones that use different versions of the data. Therefore, conclusions based on the earlier data probably need to be revisited. Uncertainty is normal, but it is also important to be careful not to make claims that are too confident in light of such uncertainties. We have provided a new model dataset of solar irradiance variability and compared it to the standard solar model used in climate studies, and two sets of observations. We have found that our solar model, SATIRE-S, agrees better with the older observations than NRLSSI model, though the two solar models and the older observations display much lower solar cycle variability than newer observations fro the SORCE satellite. We have discussed that SORCE solar cycle ultraviolet changes have a large uncertainty. We have also demonstrated that the true effect of different solar ultraviolet irradiance on ozone is highly uncertain. This is important to be aware of since one of the ways the Sun is thought to influence the climate is through a process that is initiated by ozone absorption over the tropics. There are several avenues one can take to resolve this uncertainty and here two are suggested. First, a new mission to observe changes in solar ultraviolet light is due to launch in 2017 and, after several years of operation, it may be able to give fresh insights, and lower uncertainties, as to how the Sun varies over the solar cycle. The second is to use multiple observations, both of our Sun, our atmosphere and multiple chemicals within it, combined in a way to infer more about changes in our star over decades and centuries. Since the results from new direct observations are years away in the former approach, the latter seems the more an appropriate one to take in the meantime. Table 1: Explanation and expansion of acronyms for models and instruments mentioned in this article. M. E. Andersson, P. T. Verronen, C. J. Rodger, M. A. Clilverd and A. Seppälä: Missing driver in the Sun-Earth connection from energetic electron precipitation impacts mesospheric ozone, Nature Communications, vol. 5, 2014. J. Austin, K. Tourpali, E. Rozanov, H. Akiyoshi, S. Bekki, G. Bodeker, C. Brühl, N. Butchart, M. Chipperfield and co-authors: Coupled chemistry climate model simulations of the solar cycle in ozone and temperature, Journal of Geophysical Research: Atmospheres, vol. 113, 2008. W. T. Ball, N. A. Krivova, Y. C. Unruh, J. D. Haigh and S. K. Solanki: A New SATIRE-S Spectral Solar Irradiance Reconstruction for Solar Cycles 21-23 and Its Implications for Stratospheric Ozone, Journal of Atmospheric Sciences, vol. 71, 4086-4101, 2014. W. T. Ball, Y. C. Unruh, N. A. Krivova, S. Solanki and J. W. Harder: Solar irradiance variability: A six-year comparison between SORCE observations and the SATIRE model, Astron. Astrophys., vol. 530, 2011. I. Ermolli, K. Matthes, de Wit T. Dudok, N. A. Krivova, K. Tourpali, M. Weber, Y. C. Unruh, L. Gray, U. Langematz and co-authors: Recent variability of the solar spectral irradiance and its impact on climate modelling, ACP, vol. 13, 3945-3977, 2013. L. E. Floyd, J. W. Cook, L. C. Herring and P. C. Crane: SUSIM’S 11-year observational record of the solar UV irradiance, Advances in Space Research, vol. 31, 2111-2120, 2003. S. Ineson, A. A. Scaife, J. R. Knight, J. C. Manners, N. J. Dunstone, L. J. Gray and J. D. Haigh: Solar forcing of winter climate variability in the Northern Hemisphere, Nature Geoscience, vol. 4, 753-757, 2011. J. Lean and M. T. DeLand: How does the sun’s spectrum vary?, Journal of Climate, vol. 25, 2555-2560, 2012. J. Lean, G. Rottman, J. Harder and G. Kopp: SORCE contributions to new understanding of global change and solar variability, Journal of Solar Physics, vol. 230, 27-53, 2005. G. Rottman: The SORCE Mission, Solar Physics, vol. 230, 7-25, 2005. T. F. Stocker, D. Qin, G.-K. Plattner, M. Tignor, S. K. Allen, J. Boschung, A. Nauels, Y. Xia, V. Bex and co-authors: IPCC 2013: Climate Change 2013: The Physical Science Basis. Contribution of Working Group I to the Fifth Assessment Report of the Intergovernmental Panel on Climate Change. Cambridge University Press, 2013. T. Woollings, M. Lockwood, G. Masato, C. Bell and L. Gray: Enhanced signature of solar variability in Eurasian winter climate, Geophysical Research Letters, vol. 37, 2010. K. L. Yeo, N. A. Krivova, S. K. Solanki and K. H. Glassmeier: Reconstruction of total and spectral solar irradiance from 1974 to 2013 based on KPVT, SoHO/MDI, and SDO/HMI observations, Astronomy and Astrophysics, vol. 570, 2014. Next PostNext Can somebody clear the air? How air quality and climate change are connected. Cite as: William Thomas Ball, Limitations in our knowledge of the Sun’s variability and impact on stratospheric ozone, Climanosco, 17 Jul. 2016.